“Looking for a Super Bowlparty in Orlando? How about a Super Bowl party surrounded by elegant, sexywomen? 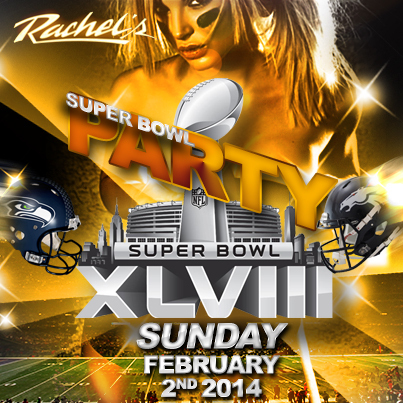 Rachel’sOrlando is your place to watch the Seattle Seahawks and Denver Broncos duke itout at the MetLife Stadium. On Super Bowl Sunday, February 2nd 2014, our beautiful models will welcome you to a BBQ Buffet from 8:00 P.M. until 11:00 P.M. As thegame ends and the party gets started, stunning girls will offer you drink andshot specials to kick off the night right. Bring your buddies, and share a bucket of 5 beers and 5 Patrón Tequila shots… That’s our BucketDeal for Super Bowl Sunday! Besides meeting the hottest women in Orlando – hell, in all of Central Florida – if you wear a Super Bowl Team Jersey, you’ll get 2 FOR 1DRINKS EACH TIME YOUR TEAM SCORES!